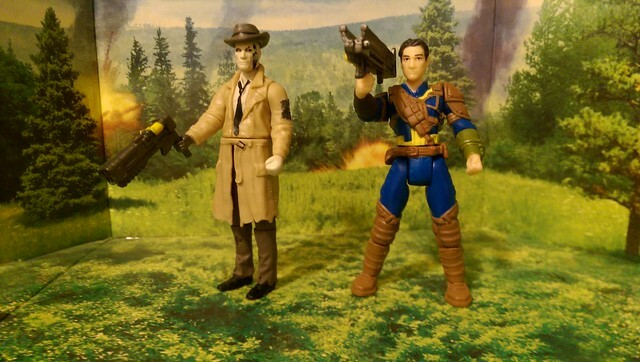 Found Nick Valentine and Vault Dweller at Gamestop today. They were 25% off. Only saw 1 of each, but at least 2 or more of the new armors. Sorry for the crappy pics; I'll try to get some better ones once I unbox them. 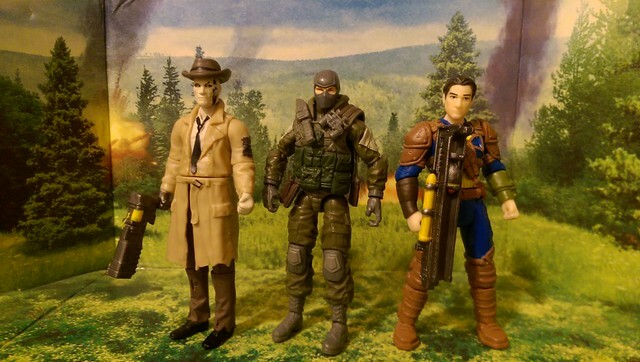 Vault Dweller's proportions seem a bit bulky, but Nick Valentine looks surprisingly good. Nick in particular scales pretty well against Joes. Vault Dweller's overall size scales OK, but his proportions are a little exaggerated. 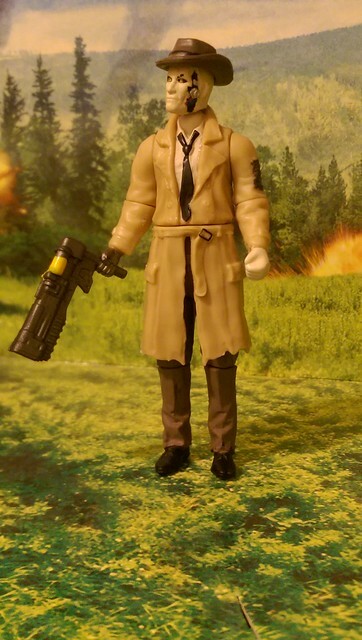 The "skirt" of Nick's jacket is removable once you detach his waist. Note that the waist plug is beveled to allow the jacket skirt to fit flush while the upper body is attached. The exposed bits on the side of his head are decently well-done. 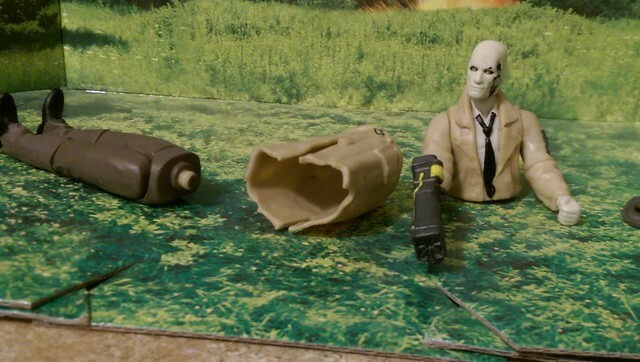 Mine has a bit of a splotch over his left eye, but since he's some kind of cyborg, it barely seems out of place. 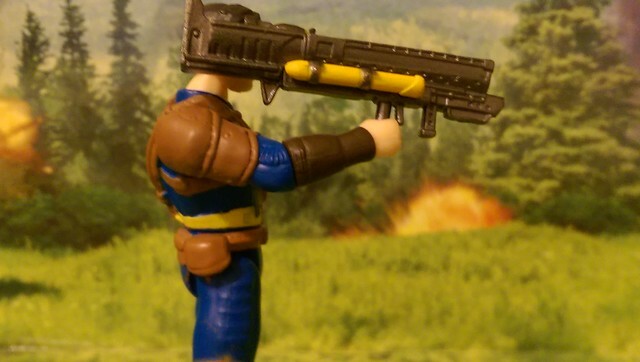 Vault Dweller's Fat Man launcher can't rest flush against his shoulder, largely since the trigger prevents him from gripping the whole handle. I'm not going to shave mine off, but you might want to consider it. 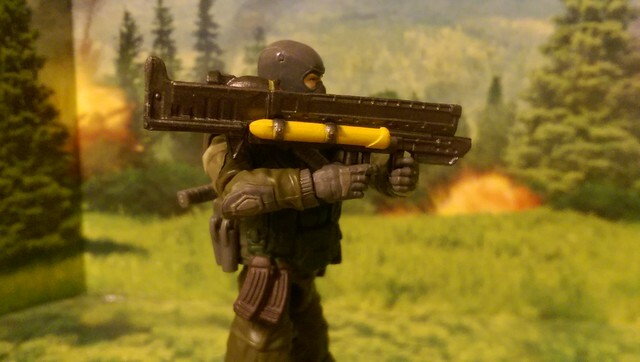 The warhead is not removable. At least, it's not intended to be, but you could probably force it out since it looks like a separate piece. 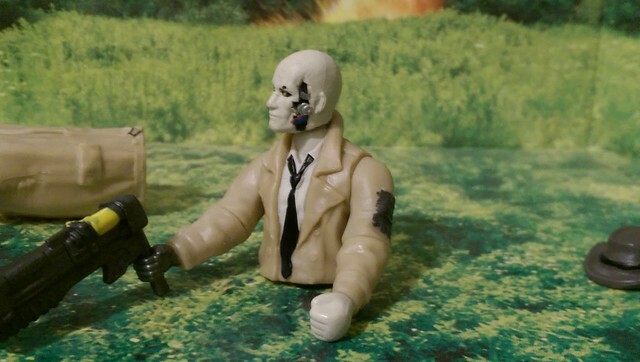 Some Joes can two-hand it well. I'm actually pretty impressed with Nick. I don't know much about the character, since I haven't played whichever game he's in, but he's a fairly sharp-looking figure. Heres a Funko Pop vinyl sentry bot. It has no articulation but is still cool and goes with the 4" figures pretty well. The surface has a matte finish, so it's kind of got the texture of bubble gum or candy. Last edited by MagicWazard; 12-06-2018 at 04:43 AM..
Cracked open those two figures yesterday. It's hard to tell from the picture, but the Nuka Cola armor has a nice sort of pearlescent sheen which makes it look quite a bit prettier than the color scheme alone would indicate. The Female Vault Dweller is more or less what you'd expect from the picture. It's not immediately obvious, but the lower legs detach from the uppers right above the boot line. She generally needs to lean back a bit to keep her balance, but being able to rotate the boots at the joint helps her balance a bit.